You don’t know what’s under that powder! Off-trail riding closes trails. With greater than 70% of New Hampshire's land under private ownership, the key to maintaining our access to trails is respecting private landowners. Unless you are on an approved trail system or you have obtained permission for the specific piece of land, you are in violation of the law. Off-trail riding damages property. Some riders feel that if they are way off in the woods, off-trail riding isn’t hurting anything. Not true. Fish and Game receives many complaints about off-trail riding and the impact it has on wildlife and regrowth of young forest. That’s because a small ride through a clear-cut can destroy new growth for years to come. Damaging the tops of saplings will negatively affect future timber values of those trees. A short foray through a freshly planted hayfield can set a farmer into a financial tailspin. Off-trail riding can be dangerous. When trails are cut and maintained by the Trails Bureau or a local club, blowdowns, overhanging branches, and rocks are removed. The trail is groomed and, for the most part, free of hazards. When you venture off-trail, you don’t know what is under that powder. You are just simply hoping that it is bare, smooth ground. You are likely to encounter anything from blowdowns to large protruding rocks and tree stumps, even stone walls -- all the stuff that is cleared from the legal trail. 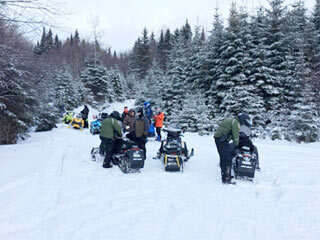 Fish and Game Conservation Officers are called multiple times into the backcountry to rescue groups of snowmobilers who are stuck or lost because they left the trail. Their actions not only put the riders in danger, but also the officers tasked with their rescue. On February 21, 2017, in Cambridge, NH, a rider went off-trail and got his ATV stuck; after digging it out with some help from passing snowmobilers, the machine was put back on the trail. The operator climbed on the machine and had a fatal heart attack. On March 16, 2017, in Stewartstown, a small group of riders on sleds went off-trail riding, and one of the machines got stuck in the powder. While digging out the machine, that operator, too, had a fatal heart attack. Because of the remote location and lack of phone service, it was a long time before help could arrive. Why sell off-trail machines? 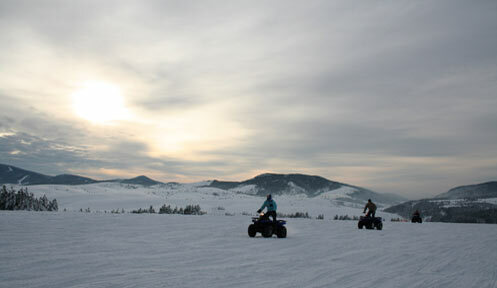 Some new sleds are designed for the purpose of off-trail riding, and people wonder why they are allowed to sell the machines if you can’t ride them. The short answer is that you can ride them in New Hampshire, but only with written landowner permission. Certain other states allow off-trail riding that you can trailer to. Have fun – and stay safe! Riding a snowmobile, hiking on a trail, or just getting out in our winter wonderland is fun and exciting and one of the great things about New Hampshire. We just need to be safe and smart when we venture out. What lies below the soft white blanket of snow has no feeling or forgiveness; it treats everyone the same. A well-marked trail that has been maintained will always be the safest place to be. So go out and enjoy all that winter has to offer, but do it safely and "STAY ON THE TRAIL, OR STAY HOME." Adapted from a winter 2018 column in the in Sno-Traveler newsletter by Dennis Etchells, NH Fish and Game OHRV Program Assistant.